If your order weighs less than 13 ounces, save huge on shipping with USPS first class (with tracking number). This product weighs 7.6 oz. 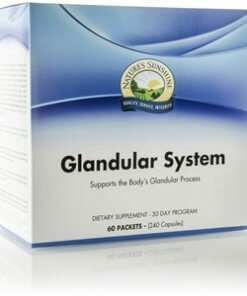 Nature’s Sunshine Glandular System Pack is a 30 day program formulated to support and stimulate the glands that contribute to mood, energy, and stress. 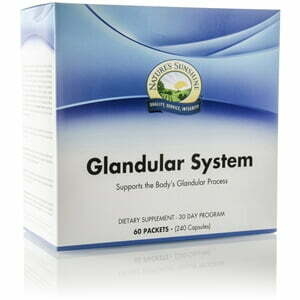 Provides a blend of herbs, minerals and other nutrients that help balance the glandular system, particularly the pituitary, thyroid, and adrenal glands. This combination of adaptogenic herbs helps the body combat stress and adapt to stressful situations. It also supports energy levels and sexual drive. Contains a blend of vitamins, minerals, enzymes and adaptogenic herbs to support and strengthen the adrenal glands, which in turn helps the body better adapt to stressful situations.